Today's project is clean and simple. Yes, I have dug the Woodland Embossing Folder out again. This card is inspired by US Demonstrator Terri Walker of nutzaboutstamping. 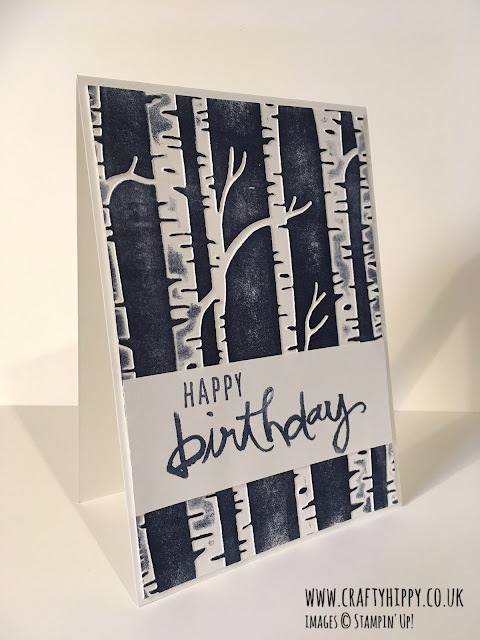 Despite not being traditional forest colours the Night of Navy combined with the Whisper White Cardstock works really well, and is elegant and classy. You can view this project and others on 10 Woodland Embossing Folder Projects. I used a different sentiment to Terri and opted for 'Happy Birthday'. I used the 'Happy' from Banners for You and the 'Birthday' from Watercolor Words. The trick to this card is to find the side with the raised trees - then flip it over. So you are actually brayering what would be considered the reverse side.